Old friends are the best. I’m not saying that new friends can’t be good too, but the ones that have been through thick and thin with you – the good with the bad – are the ones that you keep at the top of your list. They’ve seen you when you’re up and they’ve seen you when you’re down. But still, they keep seeing you. Such was the case this weekend when we attended a surprise birthday party for my husband’s best old buddy. Someone he has been friends with since grade school. These three old friends (sorry honey) – the three musketeers – were together again last night in honor of a milestone birthday. 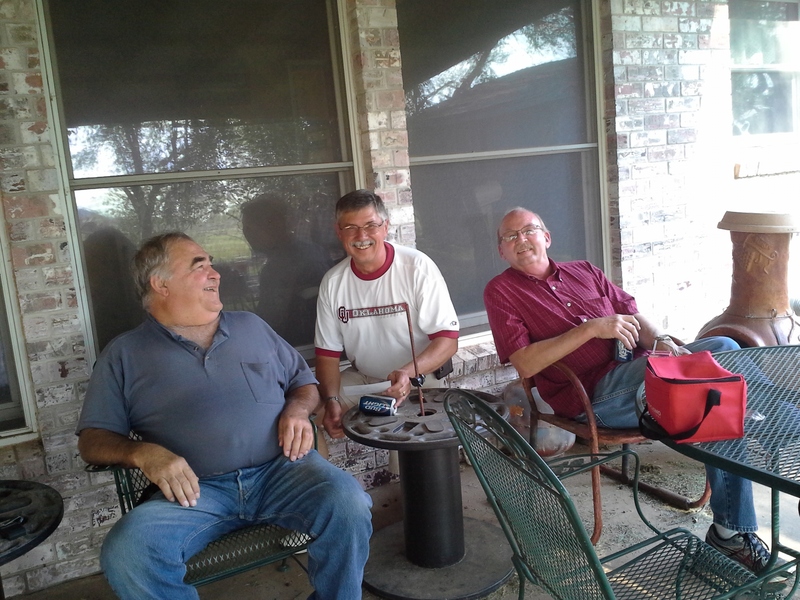 My husband, the one in the red shirt, and the other two old geezers have known each other since the first day of grade school. They’ve been through school days, marriages, divorces, births, deaths, job changes, financial changes and life in general and still came out the other end as friends. They sat around the dining room table last night with friends and family and a great steak telling stories of their glory days, some of which were probably true. If they were true it is a wonder I have two children. It is a wonder their father survived long enough to become a father. But the friendship is what really survived so long. It is a wonderful thing to have a friend for life and live to talk about it. This entry was posted in Uncategorized and tagged birthdays, buddy, friends, three muskeers. Bookmark the permalink. How wonderful that they’re still close. And still laughing together. Fewer of us are near old friends these days.